I thought it was about time I got round to writing a post about the London Marathon. In case you didn't know, I'm currently in training to take part in this years event on the 22 April. I'm half way through a 16 week program and although there have been a few hiccups and missed runs, my cumulative total stands at 118.5 miles so far! As well as it being a personal challenge I am running to raise money for a very special charity. ARC (Antenatal Results and Choices) provide information and support to expectant parents throughout the antenatal screening process. I really hope that none of you ever need to turn to them for help, but for those that do they provide an amazing service. Here is my story. In August 2008 I discovered I was pregnant. It shouldn't have come as a complete shock as although we weren't actively trying for a baby, we hadn't actively been trying not to have a baby either! But nothing had happened for some time so it had sort of slipped my mind. We went through what I guess are all the usual emotions: panic, fear, nerves, and of course excitement! We were going to be parents and although that sounded terrifying it was also amazing. Apart from telling close family and a couple of friends we kept it to ourselves. We were going to wait until after the first scan to tell everyone. Unfortunately, for us that wasn't going to happen. We were both full of anticipation at the start of the scan - we were going to see our baby! I started to worry when the doctor didn't turn the screen towards us. I started to cry when she called in more doctors. They were very good and explained clearly what the matter was. Our baby had anencephaly, a neural tube defect. But I was in shock. All I heard was the phrase "incompatible with life". We learnt more about anencephaly over the following days (Google is both good and bad!) Our baby was developing without a forebrain and although could continue to grow inside the womb, and possibly could survive birth, she would not be able to live. Learning all of these facts meant that we really felt like there was only one choice to be made, but that didn't make choosing it any easier. Although there were no outward signs I was pregnant, I was surprised at how strong my maternal feelings were already. I wanted to protect my baby, I had imagined holding her, thought about her name, even thought about what school she may go to! It's hard not to get carried away. And yet I also wanted it all to go away. I can't begin to explain how many conflicting feelings were going on in my head. I had the termination at the end of October and a few days later we went away on a pre-planned holiday. I came back three weeks later and started to get on with 'normal' life. Most people hadn't known I was pregnant and it seemed odd to tell them I wasn't now, so nothing was said. On the outside everything was the same but on the inside I was screaming. It wasn't until mid January that I realised I wasn't coping and I asked for help. Luckily, I work for a fantastic company who have a great employee support system. They organised a series of counselling sessions and gradually I began to manage all the feelings I had been struggling with. Unfortunately, throughout all of this we had no idea that ARC existed. I really feel that they would have been able to help us at a much earlier stage, and although our decision to end the pregnancy would have stayed the same, we would have had more information and support afterwards. More than anything it would have helped to know that we were not alone. I came to know about ARC through a close friend who regrettably had similar devastating news at her 22 week scan. They provided support through a helpline, a web forum, newsletters and counselling advice. The amazing thing is ARC provide this support for as long as it's needed, not just at the time of the screening. This is so important as it takes time to process all the feelings and other events can trigger things off. For example, trying for another baby can be an extremely difficult time. 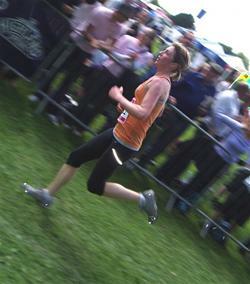 I had enjoyed running for some time but throughout the grieving process I channelled a lot of energy into it. It made me feel good, gave me time to think, and to not think but just get away from it all for a while. Once I decided to run the London Marathon there was only one charity I wanted to raise money for. If I can help just one couple with the money I raise, or even by someone reading this story then it will all be worthwhile. If you are able to donate any money to support ARC you can do so by visiting my page here All donations will be hugely appreciated both by me and ARC. Thank you for taking the time to read my story. A very good friend of me told me at one of the low points that "it will all be alright in the end. And if it's not alright, it's not the end." If you have read my blog before you will know that we now have a beautiful two year old son. I hope he will be proud of me on April 22nd! It is really brave of you to share your story Ange, and thank you for highlighting the work that ARC does. Losing a child at any stage of development is absolutely horrendous and it really does help to have external support. I wish you all the best for the marathon, I think you are amazing! Thanks so much for sharing your story Angela, such a brave and personal thing to do, but also hopefully quite cathartic for you - even though what happened was a few years ago now, this is all still part of the grieving process. I hadn't heard about the ARC until now, but now I know about their wonderful work, I will definitely be supporting both them and you when you run the marathon. Good luck, and well done. So many people will be very proud of you now and on 22nd April.